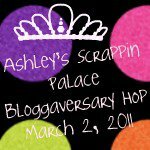 Princess & the Paper presented by A Jillian Vance Design: Ashley's Bloggerversary Blog Hop+Giveaway! I am giving away a My Pink Stamper Bag, I don't have a photo but it is really cute. Anything My Pink Stamper is cute right??? Well, that's not all! 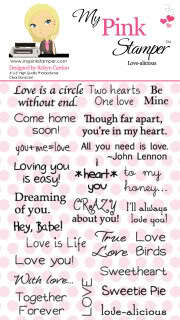 How about another Lovealicious stamp set? I will be picking 1 winner next week. All you have to do is become a follower, and leave a comment. Thanks for hopping today! If you missed anyone on the hop, here's the list. Bright and sunny! Love it! Hey Miss Jillian....a purple flower, now who would have guessed? Your card is really cute, love the sentiment. A Very cute card. Such a wonderful sentiment. Great job! Super cute card! Love that stamped sentiment! I'm already a follower! Cute card! I love the bright colors! Love the colors on your card. Your sentiment says it all. I'm a new follower. Thanks for a chance to win. Great colors, nice and bright. Thanks for sharing. I am a new follower. LOVE the card, TFS. I love sparkles. Thanks for the chance to win some awesome candy. Oh my how adorable!!! Just wonderful!!! Very pretty! I love anything with stickles, I'm obsessed seriously!!! hehehe! Thank you, and I'm a new follower, woo hoo! Such a cheerful card! I LOVE it! Amen, for stickles... just love them too. I am a follower now. So sweet. Love the stickles. Thanks for sharing. Cute card Jillian, love the stickles center. Your sentiment really does say it all. Great job. Such a pretty card. I love Stickles!! I am a new follower. Jillian you made another wonderful card! I love all your work, you are so talented! Sticlkes rock! Love the card- so cute and springy! Very nice card, I am now a follower and thanks so much for the chance to win! Great card - I love purple too. I also am a new follower. Love your card....spring is in the air !! Thanks for chance to win some nice blog candy...and thanks for sharing. Love your card, great flower. I'm a new follower as well as a subscriber. great ideas and so cute. always see new things to try! Purple and gold are perfect for each other. Very nice card. Thank You for sharing in the hop. Thanks for sharing the pretty card. WOW love the colors!your card is sooo beautiful,GREAT JOB!!!! What a pretty card. I love purple and yellow together. Thanks for sharing. Nice card. I like the color combo. Bright and sunny card! Thanks for sharing. Hi Jillian I am a new follower and I just love the name of your blog, How Cute!! You did a fabulous job and look forward to more inspiring ideas!! I am a new follower, I just found you via the blog hop. I Love this card! Too cute! TFS! Great giveaway! I'm a new follower! Love the card and the use of stickles. Hi! I´m a follower now, so i´m ready to win that wow stamps! Thanks for the chance and for sharing your creativity. What a beautiful card - love it! I'm a new follower. TFS and for the opportunity to win. Cute card! TFS and for the opportunity to win some great blog candy! cute card, love the stickles and all the purple!! Great card, very springy. Love the stickles! I am a new follower. Such a bright and cheerful card. Love it... I'm a new follower. Awesome card!! I am a new follower and hope I am still in time for candy!!! I love the card! Great colors!